Trooper Parker was born in 1959 at Tarrytown, New York and spent his early childhood in Gloucester, Massachusetts before moving to Wolfeboro, New Hampshire. He graduated from Kingswood Regional High School and Johnson State College in Vermont. He was a member of the Wolfeboro Police Department for six years prior to being hired by the New Hampshire State Police in 1986. He worked at both Troop B and was later transferred to Troop E. He was also assigned to the DWI Unit in Concord for some time. 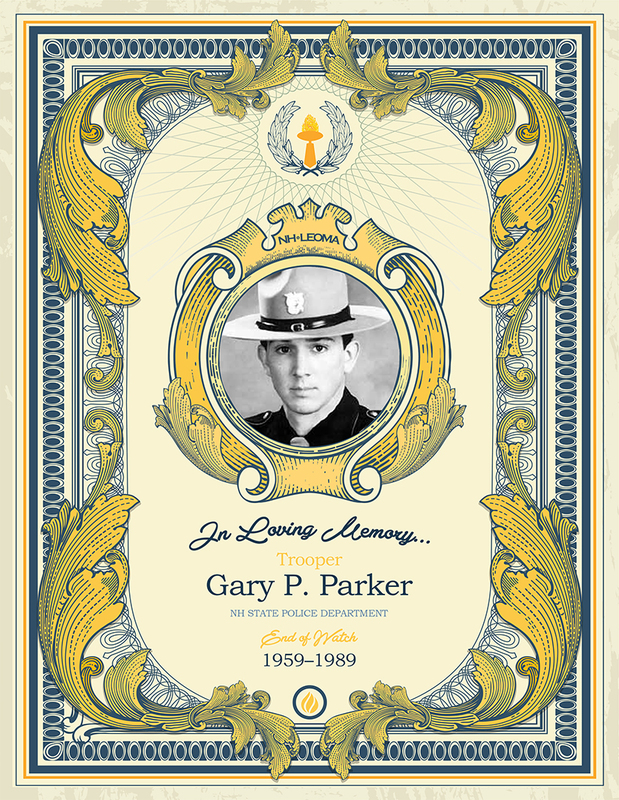 Trooper Parker died in the line of duty along with Trooper Joseph Gearty while the two were transporting a prisoner to the Grafton County Jail when their cruiser was crushed by a load of lumber that broke loose from a tractor-trailer. It was Trooper Parker’s first day at Troop E. All three occupants of the vehicle died. Trooper Parker was 30 years old. Trooper Parker was survived by his 16-month old son Gregory and his wife, Amy, who was pregnant with their second child, Lindsay.